Mommy Gossip: I Am Thankful for... Good Books! I Am Thankful for... Good Books! When I became a mother for the first time, one of the most important things on the long list of things to teach my child was to read. 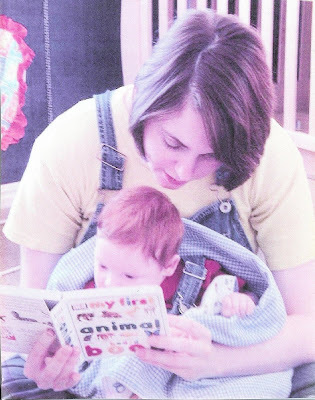 In this picture, I am sitting with the then 3-month-old Red Rover as we intently read his very first book. This is one of my favorite pics in spite of the fact that I am wearing overalls LOL. Both my parents are avid readers. I remember one summer vacation where my mom had her nose in a James Michener book the entire time. I kept wondering why she was reading about Hawaii when we were in San Diego. Then, I think back on when my dad accepted a job in Europe. He would be working with more than 20 different countries. So, what was the first thing he did? Bought a stack of historical books on those places, so he would be prepared. I don't think I saw him without a book in his hand for the year leading up to the assignment and the two years he was there. Ask him any question on European history and politics and culture, etc. and he can answer it for you! I fell in love with reading in my early teens when I discovered The Adventures of Huckleberry Finn. The readers in my family don't stop with my parents. My in laws are avid readers. And, my grandma was in the middle of not one, not two, but three different books the day she died. On average. she read a book a day and was one of the most well-read women I know. I wonder if Miss Havisham was well read! I am grateful for having reading in my heritage. I appreciate good literature and consider it a blessing to be surrounded by good books. I am thankful to live in a country that encourages reading and holds the freedom of speech in all forms, especially the written form, near and dear to its heart. I love East of Eden. Steinbeck is one of my favorite authors and this book features my favorite chapter in all of literature. Today I belong to two book clubs that meet monthly. I am constantly discovering new authors, genres, and favorite friends in the characters I read. My recent love? All things Kingsolver. Haven't read anything by her. Run. Skip. Hop. Fast. But, get yourself to a bookstore and start with The Poisonwood Bible. Then, buy everything else you can get your hands on. She's worth it! Wanna know a bit more before you put aside your blogging for this baby? Read my summary of this book here: The Poinsonwood Bible. Good books are so important! And, so true about it being important to pass the love on to your kids! When I was pregnant, I read 28 books. I love reading, and reading has helped my writing, it has helped me blow some steam, and get lost for a little while. I love, love, LOVE a good book. I also LOVE to read! The world could be coming to an end and I wouldnt know it! reading rocks. in fact, i was in border's this morning, and it took everything i had to pull myself away. travel books, cookbooks, novels... i love them all. my kids are VERY strong readers and i swear it's the key to their success in school. they read something once, and they get it. poisonwood bible had me completely entranced. I can't believe you are a Steinbeck fan! I love East of Eden, and The Grapes of Wrath is one of my all-time favorite reads! Btw, I tagged you over on my blog. Hee! Hee! Have you read Kingslover's other book - Prodigal Summer? I can not get past the first ten pages. I am wondering if it's just me. I'd usually have it half read by the time we got home. My first kiddo is like that and it feels pretty good to know he always sees my nose in a book. I haven't read any of these. BTW, I have no experience with fundraising. I work with at-risk youth. Also, do you want me to email you the link for that election post for tomorrow, or do you already have other posts you picked? Oh, and overalls were AWESOME back in the day! I too love a good book! In fact I always have a book with me, it's like a safety blanket for me. I love good books! In fact Joe Braden and I just started a really awesome one at his bedtime reading tonight! i was JUST in hannibal! (where mark twain grew up) and i loved the poisonwood bible - what a book! I just finished Poisonwood Bible! I mean two days ago! Funny seeing it here. I have mixed feeling about the book, share at another time... I also enjoyed East of Eden, I read that several years ago, and thought it was good. My boys LOVED The Adventures of Tom Sawyer, haven't read Huck Finn yet to them. I am about to start The Shunning by Lewis, have you read it? I too love books, in two book clubs and can barely keep up but love being introduced to new books. Fun post! I'm really not a reader. I used to be. I actually (slightly embarrassed to admit it but) was reading a book before I had E-Man and I have not gone back to it after having him. I need to get back to it. I love good books!!! And I collect quality children's books for my kids and then pass them to myself at school for my students. I LOVE that top photo with you and baby red rover. He's looks like he's really getting into that book. I have not read the Poison Wood Bible yet... keep meaning to but other people keep dropping off book towers for me to read. Nothing tops reading. I'm always in the middle of three or four books. I've always wanted to read East of Eden, but have never quite gotten to it. Favorite books: The Adventures of Huckleberry Finn, A Christmas Carol, and Charles Kuralt's America. I love the well written word. I love to read books too, only I can't find enough time. I have got my children in to the reading habit, I am glad. Heeheehee, I think that's the first time we "met"...because of The Poisonwood Bible debate. LOL! Love the post and the shout out for reading!! My husband and I started reading to our little ones in the hospital. My girls first book was "Guess How Much I Love You??" We still love Big Nutbrown Hare and Little Nut Brown Hare! I love the photo of your little one reading-so sweet! As a former teacher, I can't stress the important of reading more! So much research out there and how it afffects the lives of children and their future. Actually thinking about going back to school for Library Science because this is such a passion of mine. Home with girls for now and just started selling Children's Books. Thanks for visiting Creative and Curious Kids!! Glad you like the senses experiment! You know I would love this post! That picture of you reading to your newborn is priceless. I coach my parents to do the same and I have one little boy that at 5 months he is already reaching to turn the pages. I envy the book clubs. I would love to do that. Right now I am on a blog book club with Ronda's Rants. We are reading Nicholas Sparks "The Lucky One" for November. Could you sent me an email of the books your clubs are reading? I love that you read to your 3month old! I love that your grandma read a book a day! WOW! I can't wait for Sophie to read--I too think it's the best ever, although I admit I prefer children's and young adult books to the big classics. I have been known to pick up some good non-fiction though. Great post! I am thankful for good books each and every day! 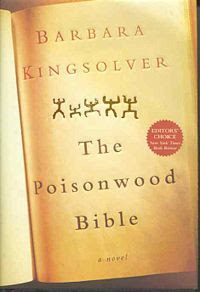 I love Barbara Kingsolver...and I agree...everything that she writes is wonderful. Another great author is Geraldine Brooks. Everything is fabulous - including her non-fiction. EXACTLY -- The Poisonwood Bible is WONDERFUL!!!!!!! !